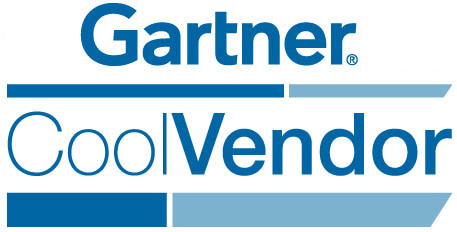 Customer micro segmentation strategy is responsible for some serious increases in sales. In fact, according to the research on email marketing by Lyris (now Aurea), 39% of companies who implemented micro segmentation marketing based on audience-specific information and tailored their messaging accordingly got 39% higher open rates, 28% lower unsubscribe rates, and 24% make more money from their email marketing efforts. Imagine the possibilities if you could segment your audience and adjust your messaging accordingly across push notifications, SMS, landing pages, and in-app displays. It’s a big deal, to say the least. And typically, when you run the data on a customer segmentation tool, the results almost always point to the fact that more customer equals more relevance, which equals more brand loyalty, which equals more sales. Most often, we hear that we should implement micro segmentation marketing strategy on our audiences based on things like location, job title, industry, past purchases, and what device they’re using. But there’re loads of other ways to segment your audience for more targeted and effective marketing messages, many of which you probably haven’t thought of yet. 1. Customer Segmentation Via Application Completion. Who’s a Serious Prospect & Who Isn’t? True, we normally segment these users out as they move through the sales funnel… but normally it’s only based on what stage of the funnel they’re in. Like when you move someone out of the “Qualified Leads” group to the “Prospects” group in your CRM it’s because you see that they’ve shown interest in one of your offerings. It’s a good practice, but a great way to optimize your marketing messages within a group like your Qualified Leads is to find out which qualified leads are more serious about seeking a solution, and which ones are just passively collecting free information from you. The way you can do this (and the way I’ve done this recently for my own copywriting business) is to put your qualified leads through an application process in exchange for something of value that you’re offering for free. The application doesn’t have to be long and drawn out. The idea, though, is to separate the qualified leads that are willing to act to make an improvement from the leads who are only “qualified” because they’re actively taking whatever free information you offer to send their way. By knowing who’s more serious (and in my case, giving them a free 20-minute messaging consult), I can segment out those who will be easier to sell to and modify the kind of messaging I send them. This boosts my sales and ensures I don’t miss out on any ripe opportunities my current sales system wouldn’t have picked up on. 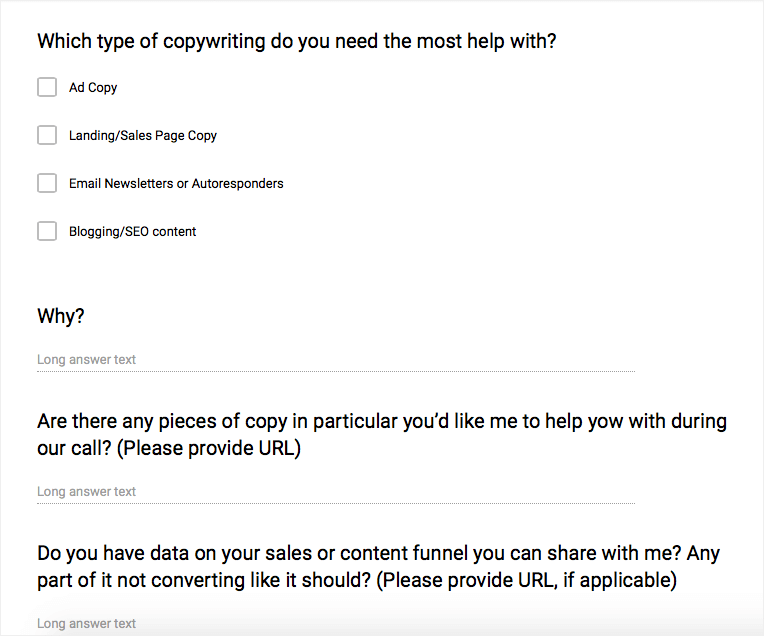 Here’s a screenshot of the Google Form I used as an application for a free 20-minute consulting spot. It wasn’t that difficult to fill out, but I only sent it to people who I thought were serious prospects. Of course, not everyone filled it out, which allowed me to really focus on the sales I could easily make while modifying the messaging towards the people who aren’t totally ready to become my customer yet. By the end of it, you’ll be able to sort out people who fall into different audience segments to help you with your messaging. 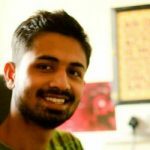 In a way, search engines crawl websites for keywords and backend metadata, other web tools (like Datanyze) crawl websites looking for bits and traces of code to identify what kind of plugins or tools a company is using on their website or in conjunction with their site-based marketing efforts. But beyond finding out if one of your prospects is using a competitor’s product, you can identify what other types of web-based technology they’re using, too. 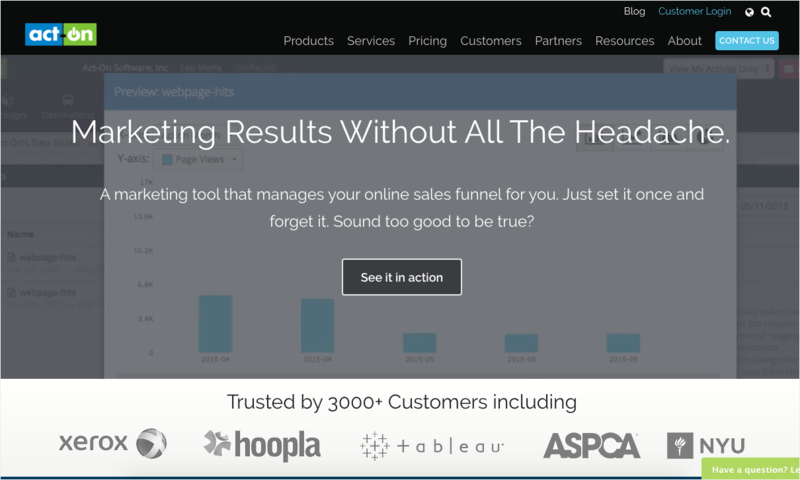 So if the CRM you sell works better with MailChimp than any other CRM out there, you can search for prospects who already actively use MailChimp. And once you’re sure they’re using MailChimp, you can segment your messaging to be more targeted towards what their day-to-day operations are already like, increasing your relevancy with them (and your conversion rate). In one instance, for example, Datanyze helped Act-On (a marketing automation software company) identify prospects that didn’t currently use any type of marketing automation while also finding out which technologies they were currently using. 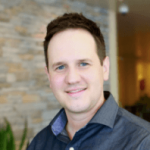 This helped them identify niche segment who they were talking to and customize their email messages based on the new information Datanyze gave them. Within 3 months, they had 35 new opportunities, with a handful already converting into paid customers. 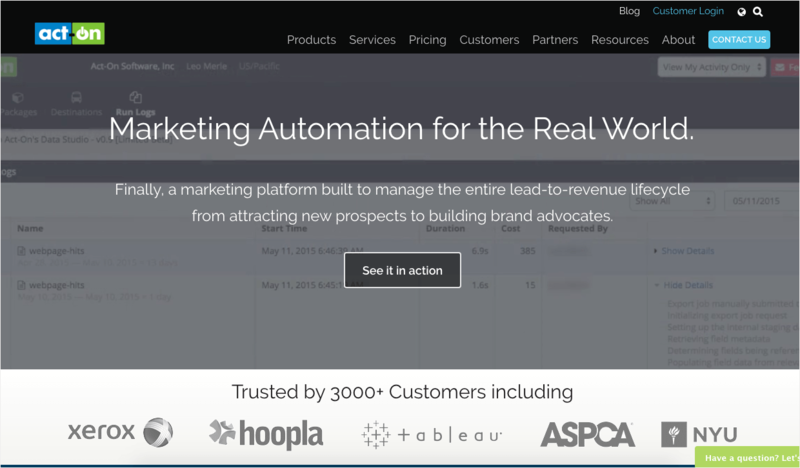 Below is a purely speculative example of how ActOn could change their homepage messaging for customers they know aren’t using any kind of marketing automation. Here’s what ActOn’s homepage currently looks like. We’ll assume this is the text they display to a general visitor, whom they haven’t tagged with any kind of segmentation. And here’s the text they might display to someone they know isn’t using any kind of marketing automation. Do you see how it’s instantly more effective? Almost every single social media channel gives you the opportunity to put people into separate groups (or lists) of some form. Facebook has different types of Friend lists you can sort people into, Twitter has both public and private lists to cultivate your feed based on certain topics or certain types of people, and Google+ has Circles you can label however you choose. Here I can see where other people on Twitter have segmented me into different lists by how I relate to their business. By starting with basic demographics like job title, company, industry, and so on, you can start to observe different patterns within these separate lists over time. 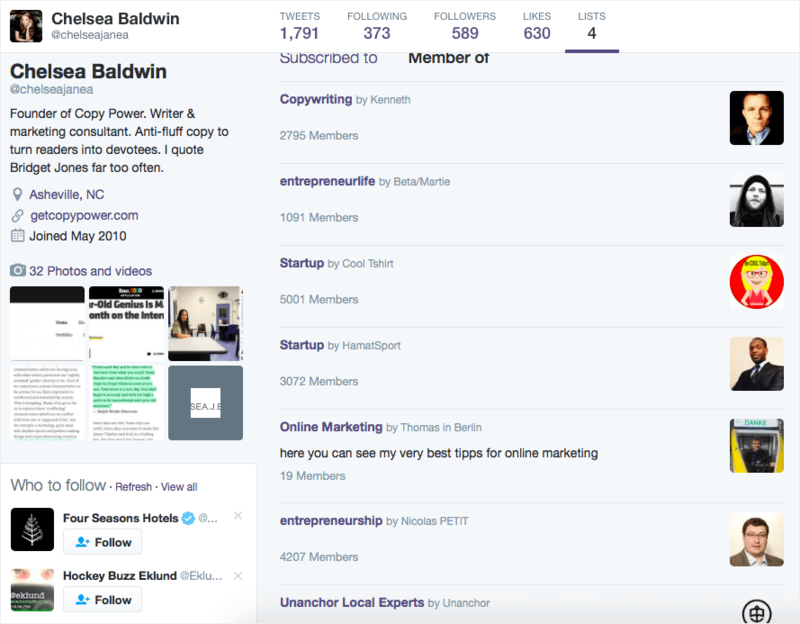 For example, if you implement social media segmentation on a list of people who work in social media, you might notice that you’ve got solopreneurs who offer social media services as well as social media managers at corporations. You can take note of people who take care of their social media posts via automated posting tools, and the people who prefer to do things manually. Social media audience segmentation of your broader social media lists down into more niche segments helps you know what kind of audience you’re looking at, and gives you ideas on how you can start to direct your messaging to speak to the differences you notice, increasing your relevancy with your social followings, boosting your business. When ProCogia helped one of their clients segment their social media following into three groups based on their engagement with the client’s social media channels: brand advocates, observing hobbyists, and prospective targets, and then optimized for each type the timing, frequency, and quality of the posts, revenues increased by 54%. ProCogia doesn’t share which client they helped increase their revenues by 54% via social media alone, but we can speculate since the word “hobbyist” was used to label one of their targets, that it could have been a photography company. Of the three profiles (advocates, hobbyists, and targets), this post would be more aimed at the hobbyists to get them more involved with the brand on social media. This message, instead, could be geared more towards prospects because it invites them to become more familiar with the brand and its products—moving them up the social media engagement pyramid. Being “active” on social media by replying to shout-outs and fire-fighting negative reviews is one thing. But being “active” by actually caring about and noticing what your follower base shares and comments on is something else entirely… and it can make a huge difference in learning how to target your messaging. Even if it’s not 100% related to what you sell, knowing what the individual prospects within your target market are specifically interested in can help you start more meaningful conversations and have a more memorable impact on their decision-making process. For example, if you notice someone is overly concerned about productivity, the way you’d approach them to sell an accounting software would be different than if you noticed they were sharing and commenting on a lot of things about cost-cutting. In one approach, your main focus would be time-saving, and in the other approach, it would be cost savings. 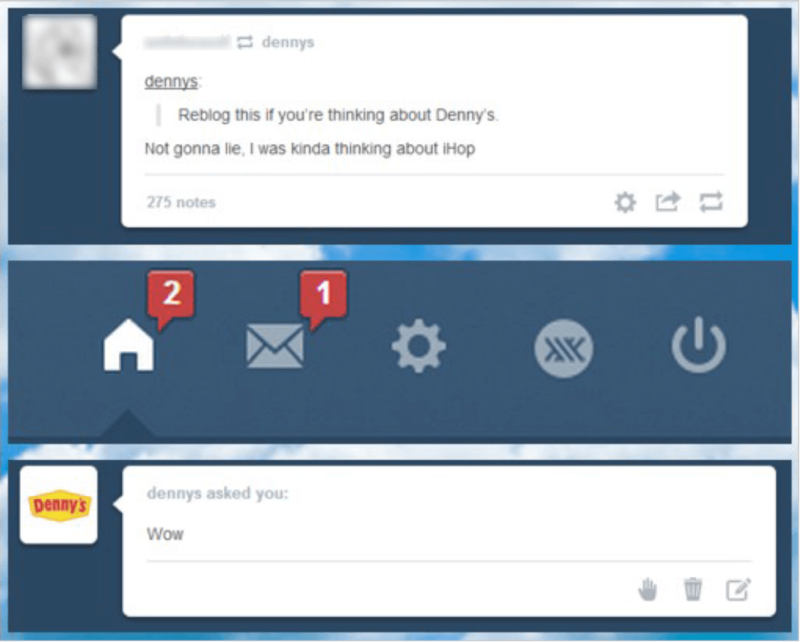 In the B2C world, Denny’s did a great job of this. 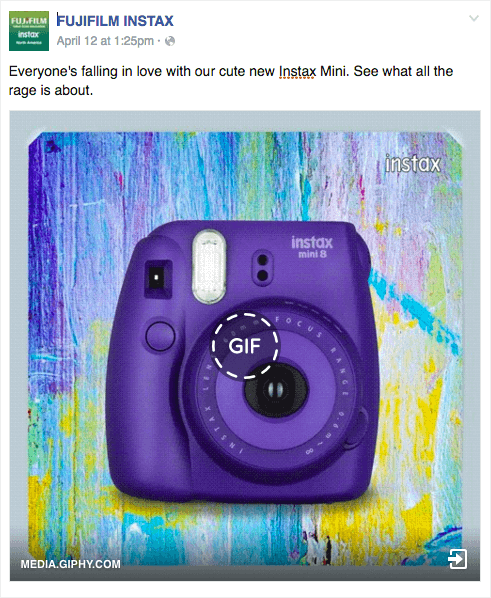 They knew they wanted to bring more millennials into their funnel, so they started hanging out on Tumblr and crafting their messages to be part of the conversation instead of just spraying their marketing slogans full-force. (Like many brands would do.) By behavioral and psychographic segmentation of their customer base, they were able to heavily engage more of their ideal customers with their brand. Yes, this is the same as geographic segmentation, but it’s that on steroids. Because with the gross amount of data available and how easily it can be connected, if you know a person’s location, you know what the weather looks like outside their window. So if you sell clothing (or umbrellas), the benefit of adjusting your messaging based on this type of value based segmentation is obvious. But even if not, weather—especially if you play up its associated language patterns—can have an effect on purchases. Skymosity is a tool that can help you do this, and they’ve helped major brands implement super effective campaigns based on local weather—including Lyft. Lyft noticed that demand for drivers increased in certain weather conditions and temperatures. So if a city was experiencing lower than usual demand because the weather didn’t meet the high-demand criteria, Lyft could stay ahead of the slump in demand by sending out email triggers based on weather forecasts via Lyft’s MailChimp account. They did something similar with the athletic company Brooks, boosting product-based sales according to current weather patterns. 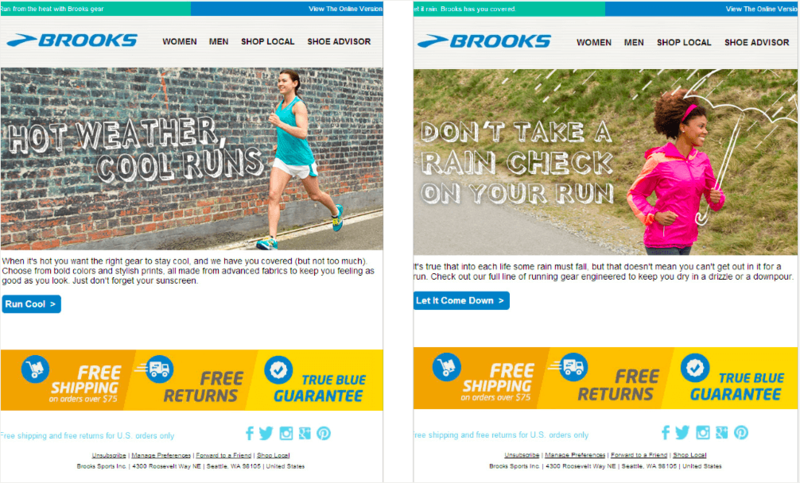 Skymosity helped Brooks make more sales based on weather. Here you can see the difference between hot weather and rainy weather. Effective, no? Not all email subscribers are created equal. At least when it comes to their engagement levels with the newsletters and autoresponders you send out. Some of your subscribers will open and click through on every single message, and others won’t open anything for three months at a time. So while open and click-through rates give you generic data about how well the messages you send to a particular email list are performing, the really good stuff comes when you look not at the list as a whole… but at the individual subscribers and what their patterns are. And you can send an email out to those on that list who don’t seem to care much about your videos a reactivation offer, or an incentive to start opening your emails and clicking through. Within MailChimp, for example, you can implement email list segmentation within an existing email list based on how engaged your subscribers are with your campaigns. HubSpot takes a similar approach with their webinars: if someone stays engaged and listens to the full webinar, they send them tailored emails with middle-of-the-funnel offers, whereas for subscribers who stopped listening after 10 minutes will be targeted with a top-of-the-funnel offer. 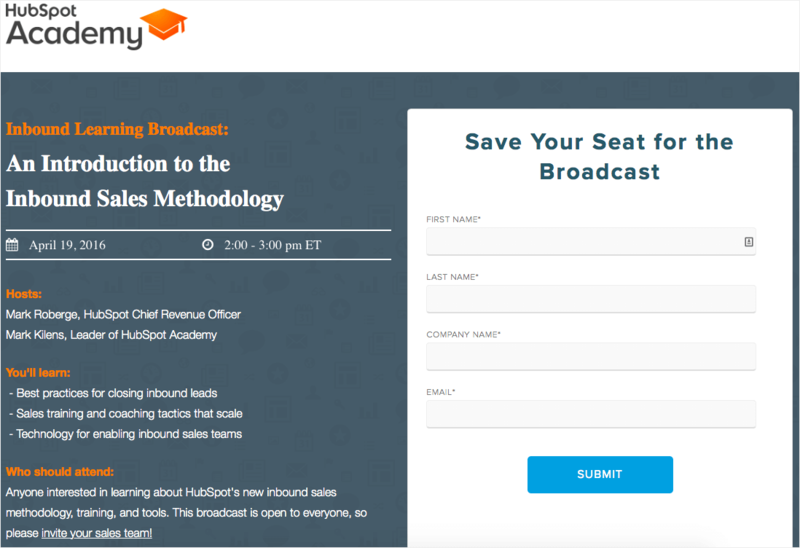 For example, if someone dropped out of this webinar early, HubSpot might send them a middle-of-the-funnel offer for another free informational product within HupSpot Academy to keep them converting and move them down the sales funnel. But if someone stayed on to the end of the webinar, they might offer a demo of their software. In conclusion, there’re so many cool ways of micro segmentation of your audience to increase both your revenues and the ROI of the budget you put into all of your marketing efforts. Because by segmenting and paying attention to the things that matter most to the different segments you uncover, your messaging instantly improves and becomes more relevant to the people you’re trying to convert into paying customers. And when you’re more relevant to someone, they instantly pay more attention to you than to your competition. So if you haven’t started micro segmentation marketing yet, run a test or two and see the results. I think you’ll be hooked.